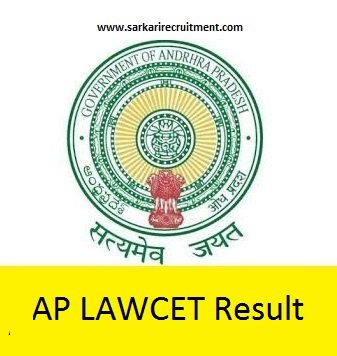 Andhra Pradesh LAWCET Results(AP ECET). Sri Krishnadevaraya University regulates AP LAWCET on Behalf of Andhra Pradesh State Council of Higher Education (APSCHE). AP ECET will be conducted for taking admissions to undergraduate law programs including three-year and five-year integrated law programs. Candidates Intend can apply Online for AP LAWCET. We provide you with clear information about AP LAWCET. The AP LAWCET Results will be declared after the examination. The candidates can check for AP LAWCET Result at sarkarirecrutment.com. The AP LAWCET Result helps Students to know the status of their Exam and to plan accordingly. Sri Krishnadevaraya University has invited online application form for AP LAWCET 2017. Interested and eligible candidates can submit their application form through official website. Details of notification are mentioned below. have to pay Rs. 500/- and all others have to pay Rs.1000/- towards processing fee which is non-refundable. duly signed by Mandal Revenue Officer [MRO]. after 01-01-2016 will only be considered. The students of Telangana have to pay the full fees. discrepancy should be brought to the notice of Camp Officer / Coordinator immediately for corrections. ensuring the correctness of the data. facility. One Time Password will be sent to the registered mobile number at the time of saving web options. 13. Candidate can download the provisional allotment order, and report to the concerned college. 17. Refer Procedure to exercise web options for instructions to the candidates for exercising options on web. candidate will lose the admission. website for the left over seats and new seats, if any, sanctioned. 21. Who should participate in Phase-II ? may arise due to sliding, cancellation and conversions. the claim on the new college as well as on the old college. Go to the Official Site for AP LAWCET Results section. Check for AP LAWCET Results 2017.